FASS Faculty Members İnci Gümüş and Mert Moral receive Science Academy's Young Scientist Award 2018 (BAGEP). İnci Gümüş receives the award in Economics and Mert Moral in Political Science. A top priority for the Science Academy is encouraging the youth to engage in good science, and rewarding the best examples. In order to choose and reward the best young academics and to support them in conducting new studies, an award program was initiated in the year 2013. Science Academy runs this program not with government funding, but with the support of the society at large. The award-winning young academics are granted 15,000 TL per year for a period of two years to support them in their research. The objective here is to reward the most brilliant and promising young academics with a prestigious grant which will help them further their studies. Scientists younger than 40 are eligible for the award. 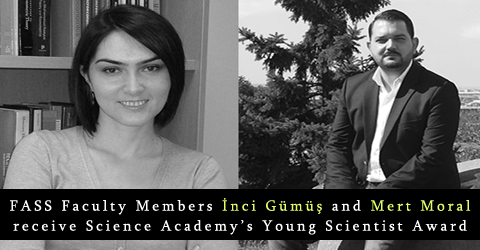 İnci Gümüş and Mert Moral will receive their awards in the ceremony of Science Academy which will be held on April 27, 2018, Friday.